No longer is the average back to school shopping list kept to pencils and Trapper Keepers… Today, nearly every brand can find success in taking advantage of this heavy shopping season. 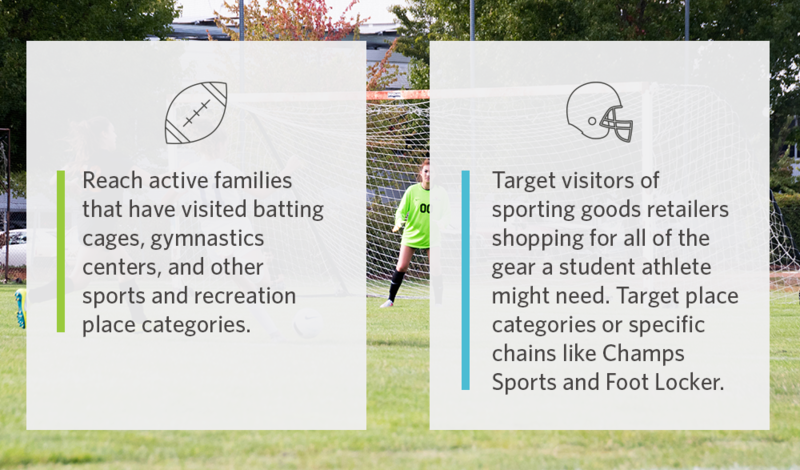 Understanding the life stages of your target audience is key for creating A+ targeting strategies for your back to school marketing efforts. To help you ace your campaigns, we’ve put together the ‘study guide’ below for the best location strategies. Just follow our handy strategy tips below or download our latest Summer & Fall Planning Guide: Location Strategies for Q3 for Fall campaign success! Sending little ones off to school for the first time is a momentous occasion. Reach parents who are getting their new students ready for school and setting them up for success. Finding the right outfit for the first day of school can seem like one of the most important decisions of the year. Today, nearly every extracurricular comes with a shopping list. Find parents looking to ensure their student has all of the gear they need to become the MVP. Whether they’re leaving the nest or returning from summer internships, reach college students looking to furnish and decorate dorms on a budget. Interested in more location strategy tips? Download our latest Summer & Fall Planning Guide: Location Strategies for Q3 for Fall campaign success! You can also contact our in-house team of strategy experts here for more personalized targeting recommendations.